Hiring a classic car is not only for classic car enthusiasts, for that special occasion such as a 40th, 50th or 60th birthday present or wedding anniversary it is a unique experience that guarantees to make someone's dream come true. We are located on the southern border of the Cotswolds and therefore ideally situated for the start of your classic drive in to the picturesque villages that make up this beautiful part of England. Tours are provided which will ensure you make the most of the experience. We can provide Classic Car Hire gift vouchers in the form of a personalised letter. Whether it is for a birthday, anniversary, Christmas present or just a special gift, make a loved one's dream come true, of enjoying the open road in one of our British or Italian classic cars. Bourton-on-the-Water is home to the Cotswold Motor Museum is one of the must see stops on any tour of the Cotswolds. 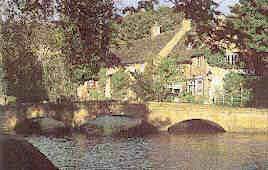 The river Windrush divides the village and may be crossed in several places by picturesque low bridges. Other attractions include Birdland Park and Gardens a display of over 500 birds from around the world, the Model Village at the Old New Inn hosting a 1/9th scale model of the village itself built in 1937 and the Cotswold Perfumery Factory where perfume for Royalty has been made. Lower Slaughter is a mile downstream on the little Eye from Upper Slaughter. Both names are derived from the old English for wet lands 'Slough'. 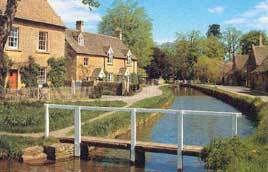 Lower Slaughter, an unspoiled traditional Cotswold village, has a Mill (now a gift shop and tea room) retaining its waterwheel. Upper Slaughter is dominated by the attractive gabled Manor house (now a hotel) parts of which date from the 15th century. Broadway was a busy staging post between London and Worcester and had many inns (33 in all!) to serve the weary traveller of which 3 remain today. 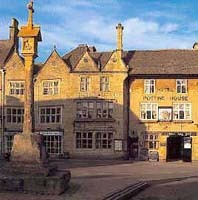 The 'Boardway' is lined with traditional Cotswolds stone buildings and is one of the longest High Street's in England. Influence for many in the arts and literacy circles it is today the location of many fine galleries. The village is overlooked by Broadway tower built to resemble a castle is a viewing point 1024 feet above sea level ? on a clear day you can see 14 counties! A beautiful old market town built on the Cotswold wool industry. It held an annual fair in the Market Square where 20,000 sheep would change hands in one day. A bustling market town which still holds the traditional market each Tuesday. Located on the Fosse Way and part of the old coaching route twixt London and Worcester. King Charles I reputedly stayed at the White Hart in 1644.